Permanent Waves is, on multiple levels, an unblinking stride toward the future, while it effectively shuts the door on the ‘70s. 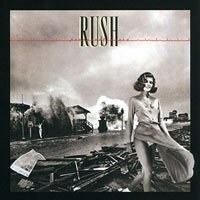 How unbelievably appropriate is it that Rush's Permanent Waves was released on January 1, 1980? In virtually every regard, this album ended the '70s (literally) and foreshadowed the fertile grounds (reggae, pop elements, concise arrangements) the Geddy Lee, Alex Lifeson, and Neil Peart would spend the next decade expanding upon. Even though it will forever be overshadowed by the masterpiece that followed, Permanent Waves is, in many regards, the most important album Rush made. Looking back on its career, Rush was not unlike Pink Floyd: each album built upon the last one and, in hindsight, one can easily see where certain ideas and obsessions -- executed with varying degrees of success -- came to full fruition on the eventual, inexorable tour de force (Dark Side of the Moon and Moving Pictures, respectively). We can hear how "By-Tor and the Snow Dog" was a test run of sorts for the longer pieces from Caress of Steel, which of course set the stage for "2112". With the confidence and conviction the breakthrough success of 2112 provided, Rush began painting with strokes that managed to be at once broader and more refined. "Cygnus X-1, Book Two" (from 1978's Hemispheres) was a triumph Rush could not -- and did not need to -- trump: it's the last side-long “suite” the trio attempted, and it remains the last necessary one any prog-rock group ever did. Not as incendiary or influential as 1976’s “2112”, it will have to settle for merely being flawless, and the pinnacle of the group’s output to this point. By 1978 the trio was truly hitting on all cylinders, musically: arguably the most ambitious of all the progressive bands (which is really saying something), Rush had spent the better part of the decade trying to make a cohesive statement where all elements came together. Interestingly, if not ironically (since irony is anathema to prog-rock) this album/song that studies and then celebrates the separate hemispheres (of our left/right brains, of our organized/emancipated natures) matches the smarts and technical proficiency with the ingredient that would play an increasingly obvious and vital role in the band’s subsequent work: soul. Rush evinced growth and improvement (musically, lyrically, and compositionally) with each successive album, ending the ‘70s with two efforts that functioned as touchstones and points of transition. Hemispheres is the pinnacle of that decade’s prog-rock formula, a convincing balance of ambition and achievement. “Cygnus X-1, Book Two” is their most successful side-long anthem; “The Trees” is a worthy follow-up to the radio-friendly “Closer to the Heart” and “La Villa Strangiato” is a stunning display of virtuosity, harnessing Rush’s musical skills, quirky humor and chemistry. The carefully crafted sonic landscapes of A Farewell to Kings and Hemispheres are entirely suitable for the material, even if the songs and subject matter now seem more than a little calculated and self-conscious. It was apparent to the band, then, and seems predictable, with the benefit of hindsight, that Rush had gone pretty well as far as they could (and should) go on Hemispheres. In this regard, it represents a culmination of a certain sound and type of record that Rush spent five studio albums working toward. One can clearly detect elements, up through Hemispheres, of each preceding album: the guitar solo on “Working Man” led to “By-Tor and the Snow Dog”, which led to “The Necromancer” and “The Fountain of Lamneth”, and then “2112”, and in turn “Xanadu” and “Cygnus X-1, Book One”, and finally “Cygnus X-1, Book Two” which connected all the dots. Permanent Waves, their first album in the new decade, signifies a tremendous stylistic shift and showcases a refined sound. It was, according to the band, a relatively painless and pleasurable record to make, certainly in comparison with Hemispheres. The arrangements are typically complex (“Free Will”, for instance, employs 13/4 time), yet the songs sound organic, unforced, instinctive. There is also a palpable sense of assurance infusing practically every note. Certainly this can be attributed to the persistent progress the band had made, both artistically and commercially. But more, there is increased evidence that Rush was increasingly in tune with the sounds and trends playing out all around them. “The Spirit of Radio”, in addition to the novel, and remarkable approximation of reggae rhythms, also suggests Lifeson was aware (if not necessarily influenced by) the FM-friendly shredding of Eddie Van Halen and Angus Young, among others. If Rush had existed, regardless of their actual intent, somewhere on the aesthetic continuum between Led Zeppelin’s adventurous, riff-laden workouts and King Crimson's deliberate, almost chilly precision, they were now using those elements in the service of shorter, snappier songs that seem fully formed and not stitched together (however inventively). Permanent Waves is, on multiple levels, an unblinking stride toward the future, while it effectively shuts the door on the ‘70s. The centerpiece of the album is the sixth and final song, “Natural Science”: it does not grab you by the ear the way 2112 does and it does not have the immediate, irresistible appeal of “Limelight”, but it’s quite possibly the band’s most perfect achievement. Neil Peart’s lyrics, which tackle ecology, commercialism, and artistic integrity (without being pretentious or self-righteous) are, in hindsight, not merely an end-of-decade statement of purpose but a presciently fin-de-siècle assessment that still, amazingly, functions as both indictment and appeal. “Natural Science” endures as the last document before Moving Pictures triangulated math rock, prog rock, and the fertile new soil of synth-based popular music and did the inconceivable, making Rush a household name. If the Snow Dog seemed a million miles in the aesthetic rear-view, "Tom Sawyer" was just around the bend. The band was seldom as tight, focused, and unfettered as it would be on this outing, while the myriad elements that make Rush so unique and organic are fully manifest. Lee's vocals were never more expressive or emotional; Lifeson's guitar solos were rarely as succinct yet devastating. Peart's lyrics took a "quantum leap forward" and if he, understandably, cringes at some of the words he wrote during his mustachioed years, he can -- and should -- remain quite proud of the poetry he produced for these sessions. Never mind the fact that the songs flat out kill, the words alone on efforts like "Free Will" and "Natural Science" stand alongside just about anything anyone has written in the last 33 years. His love of language (consider the puns-upon-puns in the album's title and corresponding cover art, a feat that would be duplicated to delightful effect for Moving Pictures) was finally met with material that upped the ante and forced him to dig deeper. In the final analysis, Rush had already made history: it was finally prepared to produce work that remains relevant and enduring.